Today’s post comes from J. Michael Palermo IV, Sr. Evangelist at Amazon Alexa. Learn what steps you should take before developing with the Smart Home Skill API. Before creating a skill, you must first determine if you want to build a custom skill or a smart home skill. Most skills are built using the Alexa Skills Kit (ASK) and are broadly known as custom skills. However, if the end goal is to enable a skill to have voice control over a device or appliance in the home, you will want to develop a smart home skill using the Smart Home Skill API. With custom skills, you must build a voice interaction model to handle customer requests. Smart home skills use Amazon’s standardized language model so you don’t have to build the voice interaction model. As such, your customers don’t need to remember your skill name or a specific invocation phrase. Furthermore, customers who already control devices using Alexa with other smart home skills already know how to use your smart home skill, and will also enjoy a consistent, first class experience with your devices. 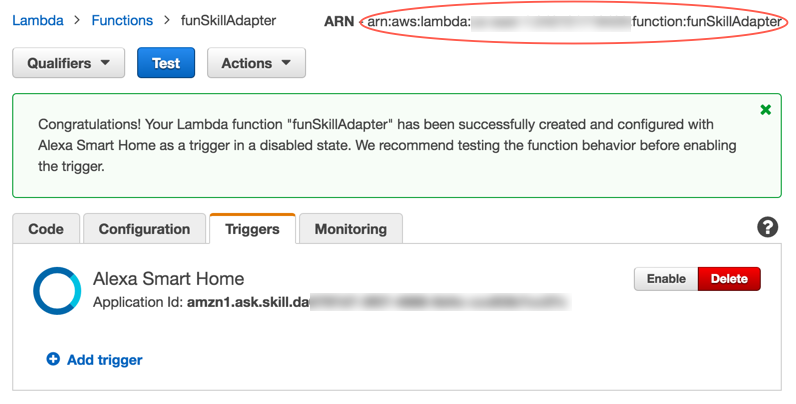 The smart home skill adapter must be hosted in an AWS Lambda function, whereas custom skills can be hosted in either AWS Lambda or another cloud-based hosting service. You must implement account linking using OAuth 2.0 for smart home skills, while this is optional for custom skills. Since smart home skills target connected devices in the home, you must have access to a cloud-based API to handle device discovery and control. With the above differences in mind, your approach to creating a smart home skill may require more work to be done upfront than with a custom skill. However, know that with a smart home API skill, you wouldn’t need to define and maintain a language model yourself, and as Alexa improves its language model overall, you get the improvements for free. Sebastien Stormacq recently authored an excellent blog post providing step-by-step guidance to implement account linking for custom skills. While much of the information in that post applies here too, there are some differences in implementation details. This post will provide complete guidance for setting up account linking for smart home skills, with some admitted overlap to Sebastien’s post. For a fine overview of OAuth 2.0 and understanding of options, it may benefit you to read the first two sections of his post and then resume here. If you have already created or chosen a specific OAuth 2.0 provider, you can proceed to the next step. 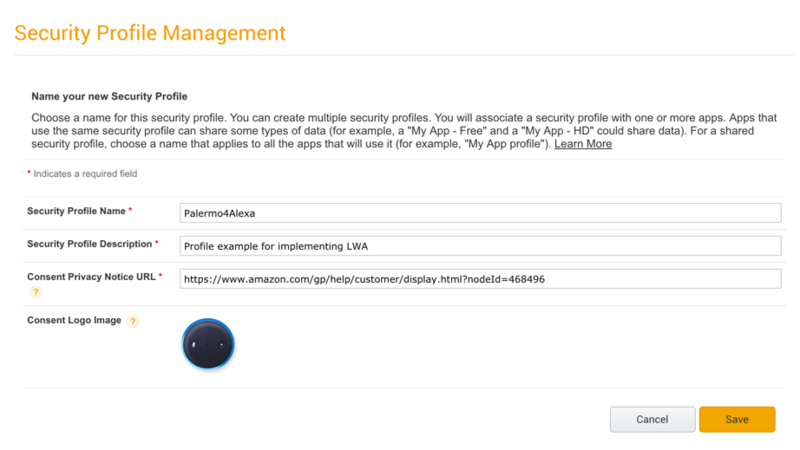 If not, the remainder of this step will show how to fulfill this requirement by using Login with Amazon (LWA). 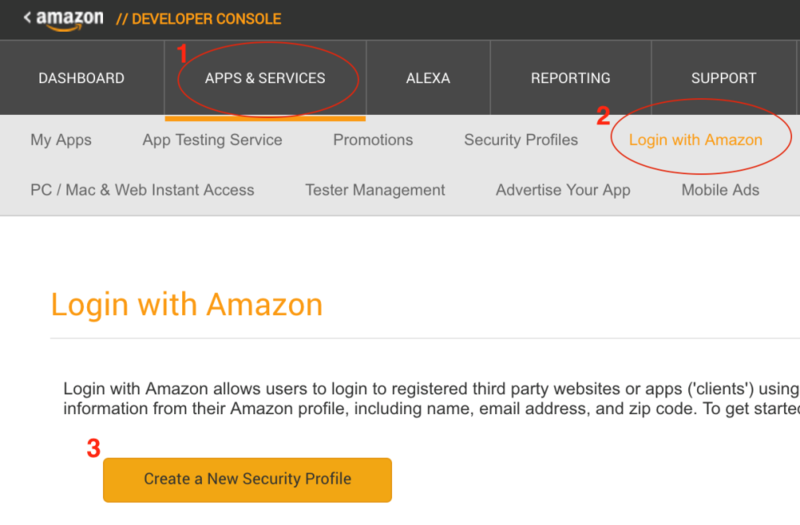 Connect to https://developer.amazon.com and authenticate with your Amazon credentials. 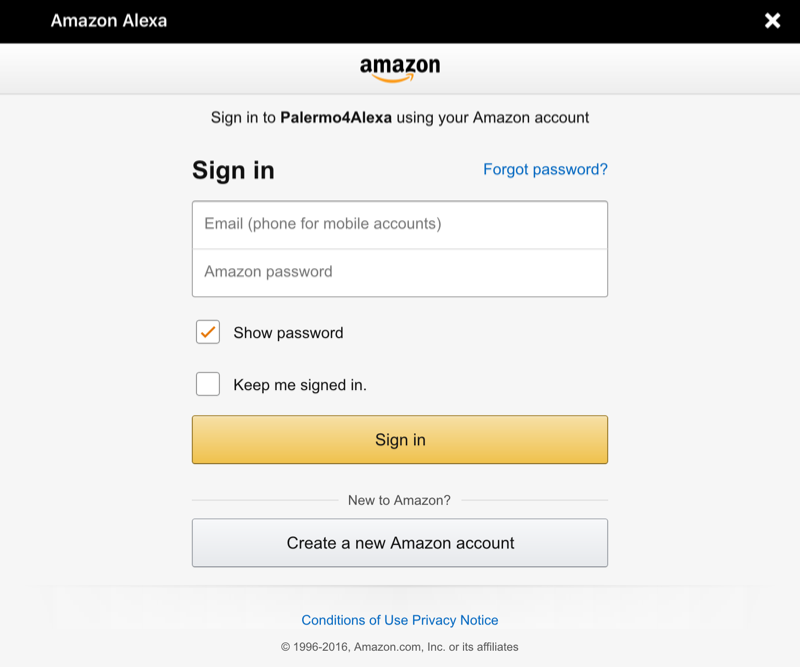 Figure 1 : Access Login With Amazon. Before you complete this step, be sure to click on the link named “Show Client ID and Client Secret” (see Figure 3) and copy revealed values to a text editor so they're easily available. You’ll need these values later in a future step. In this step, you will start the process of creating an Alexa skill. Click on “Alexa”, then click the “Get Started” button in the “Alexa Skills Kit” box. Click on “Add a New Skill” button in the upper right of screen. 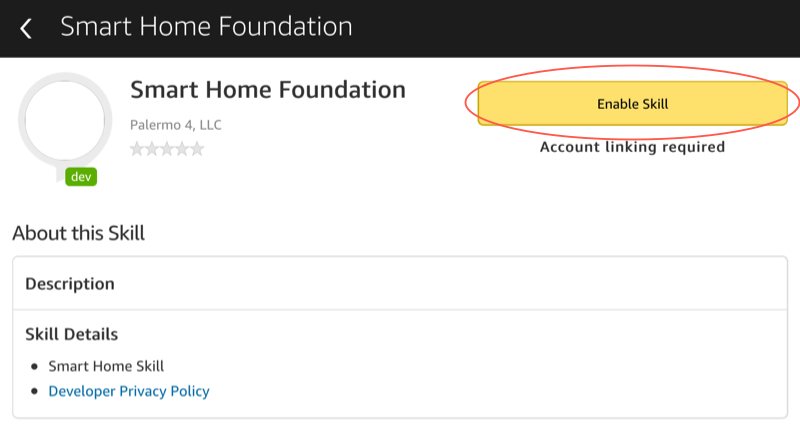 Select “Smart Home Skill API”, enter a name, and click the “Save” button. Now click on the “Skill Information” link to go back to previous screen. The Skill Information page now shows your skill’s Application ID (see Figure 7). Copy the ID and save it to a text file as it will be used in the next step. 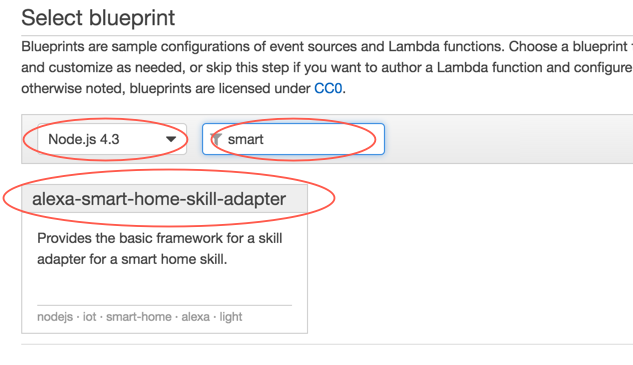 Skills developed with the Smart Home Skill API must be hosted in an AWS Lambda function. Here is how to create it. 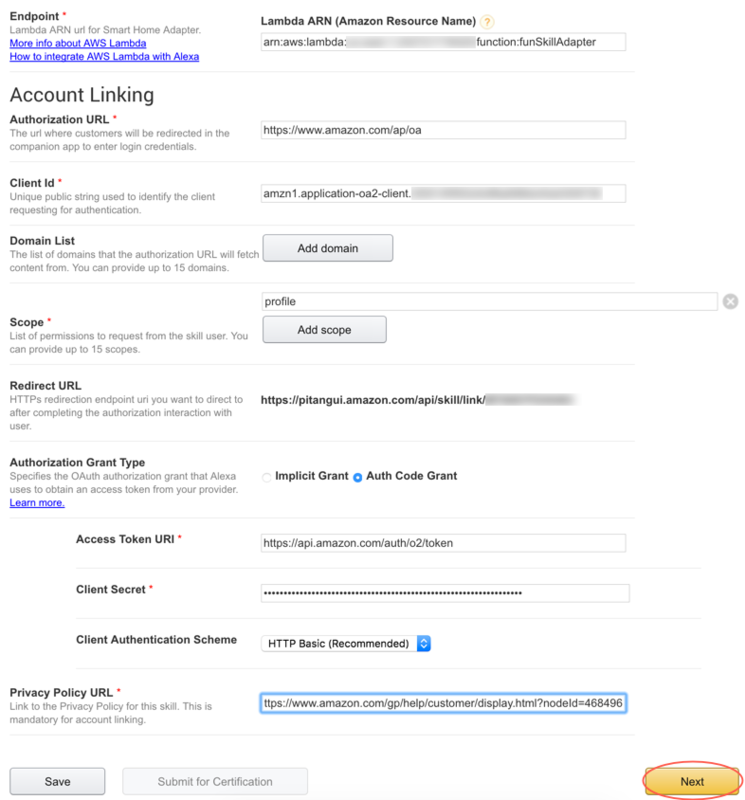 Connect to https://aws.amazon.com and authenticate with your Amazon credentials. 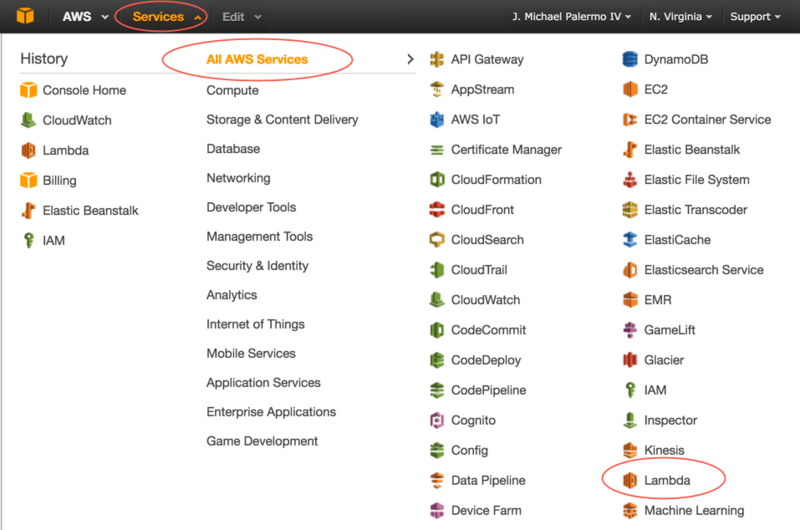 If you have not created an AWS account, do so now. 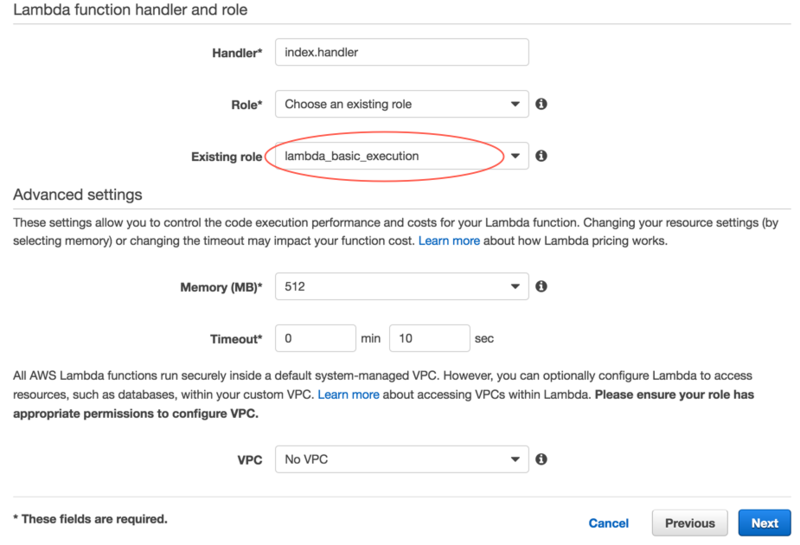 Click on the “Create a Lambda function” button. A new screen appears prompting for an Application Id. Enter the value you collected from step two (see Figure 7), and click the “Next” button. Under “Lambda function handler and role”, for “Existing role” choose “lambda_basic_execution” and leave all other values as is. Click the “Next” button. On the review screen, find the “Create function” button at the bottom of the screen and click it. You should receive confirmation the Lambda function has been successfully created. Copy the ARN (see Figure 14) value to a text file for use in the next step. No further action will be needed in the AWS console. In a future blog post, you will learn how to write code in the skill adapter. The skill started in the second step of this article will now be configured to support account linking. Return to https://developer.amazon.com and authenticate with your Amazon credentials. 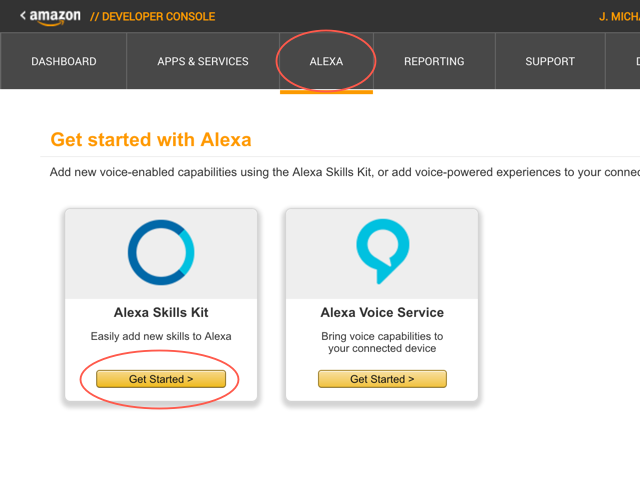 Click on “Alexa”, then click on the “Get Started” button in the Alexa Skills Kit box. In the developer portal, find the skill you created in step 2, and click the “Edit” button. Fill in values for the configuration screen (see Figure 17). An explanation of the values is provided in Table 1. Copy the value of the “Redirect URL” to a text file as it will be needed shortly. When finished, click the “Next” button. A list of up to 15 domains the authorization URL will fetch content from. No additional domain names were needed in this example. LWA supports several scopes. for this example, let’s use “profile”. This will allow your code to retrieve a unique Amazon userid, email address, and full name for the user. “Auth Code Grant” is required for smart home skills. * Values provided are specific to LWA. If using another OAuth 2.0 provider, refer to its support documentation for how to obtain these values. 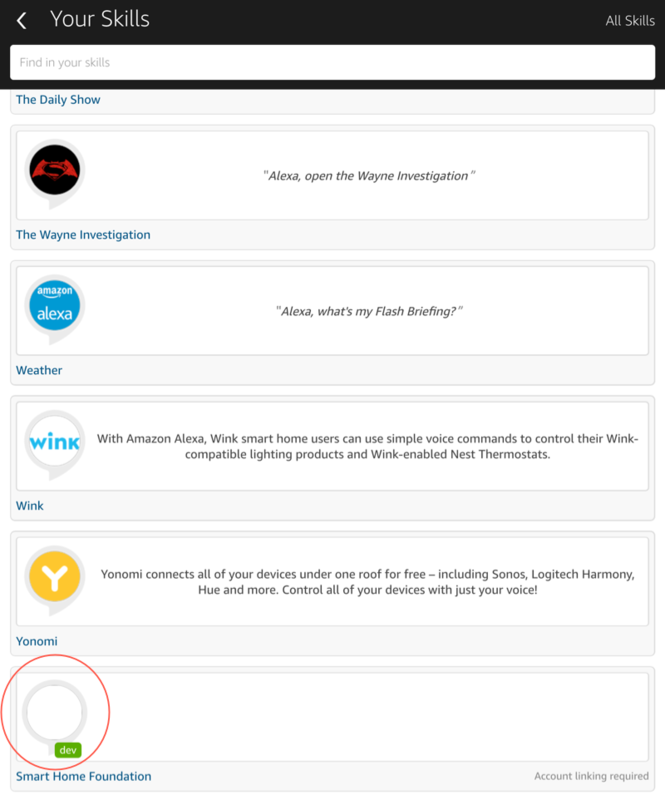 Figure 18 : Show this skill in the Alexa App. You are finished with this step. You may optionally provide publishing information if you click the “Next” button, but it is not required in the context of this article. This final step will take you full circle to the first step. A small but significant value needs to be added to the LWA profile for account linking to function correctly. Here is what to do. 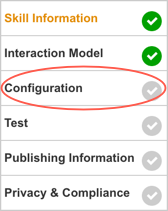 Under “Login with Amazon Configurations”, find the profile created in the first step and click the settings icon on the right. Select “Web Settings” option. In the profile management page, click the “Edit” button. In the “Allowed Return URLs” field, provide the Redirect URL value collected in Step 4 (see Figure 17). When finished, click the “Save” button. Your LWA profile is complete. 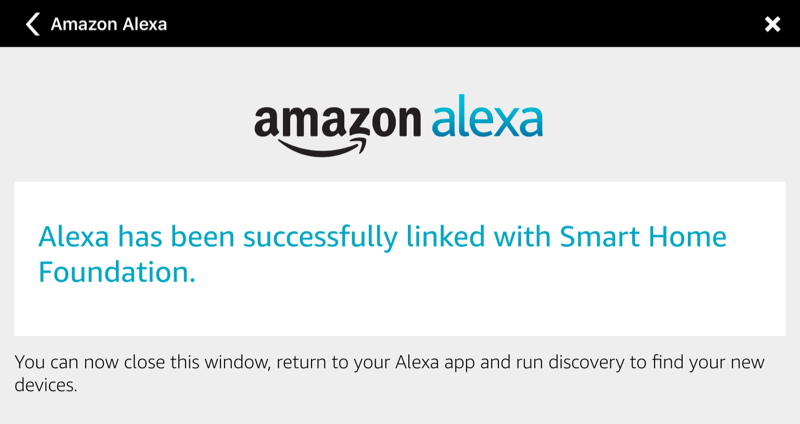 It is now time to confirm account linking was successfully configured by enabling the smart home skill in the Alexa companion app. Here is what to do. Open your Alexa companion app, and select “Skills” from main menu. In the skills screen, locate the “Your Skills” link at the top and select it. You will receive confirmation that Alexa is linked with your skill. If prompted to discover devices, select “Cancel” button. Congratulations, you have met the prerequisites for creating a skill using the Smart Home Skill API. Well if you recall, the code file in skill adapter was left blank. This was done to prove that enabling account linking with the Smart Home Skill API does not require code. However, accessing account values, enabling device discovery, and controlling devices all require code. These topics will be covered in upcoming articles, so stay tuned.